Of the four display towers featured in Peschke Field at the 2013 National Jamboree, the Stilt Tower was the second to be constructed, hoisted, and anchored. It gets it’s name because it stands on only two legs, and hence it’s dependence on four essential guylines to hold it up. 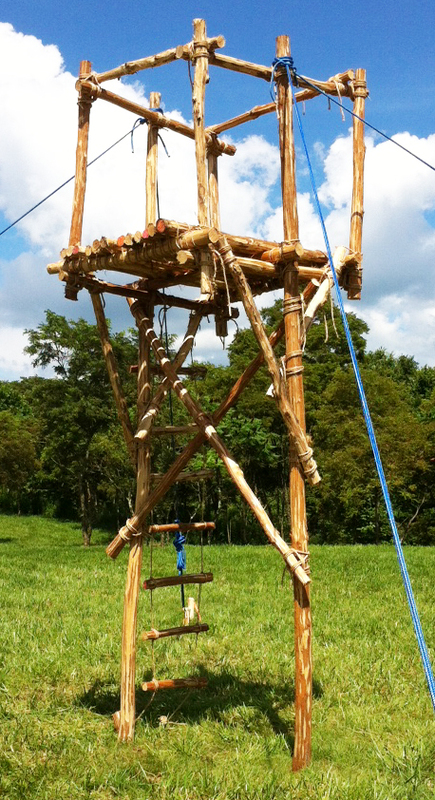 The tower presented somewhat of a building challenge to the crew assigned to undertake the task. They had never built one before, and all they were given was a drawing and a sketchy list of materials. The Stilt Tower exhibit turned out to be both good-looking and novel. For a procedure and instructions refer to Pioneering Made Easy: Stilt Tower.